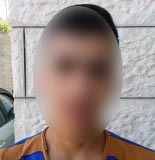 On 18 August 2015, a 17-year-old youth from Nahhalin is arrested by Israeli soldiers at 2:00 a.m. and accused of throwing stones and starting a fire. He is released without charge two days later. My father woke me up at around 2:00 a.m. and told me Israeli soldiers were in the house asking for me. I got up and heard soldiers talking to my father telling him they were going to arrest me because I was accused of throwing stones at the settlement of Bitar illit. The soldiers did not give my father any documentation but they told him they were going to take me for questioning at the settlement of Etzion and would send me home afterwards. The soldiers wanted to see my ID card but I told them I didn’t have one yet so they asked me for my birth certificate. The soldiers allowed me to get dressed and then took me outside where they tied my hands to the front with three plastic ties: one on each wrist and one connecting the two. The ties were not tight. They also blindfolded me and put me in the back of a jeep and made me sit on the metal floor. The jeep drove for more than an hour and I think it crossed into Israel. I could see through the blindfold that the jeep crossed a checkpoint at the border with Israel. The jeep then stopped at a military base and I was taken to a courtyard and made me sit on the ground. The soldiers then took me to see a doctor. The doctor removed the blindfold during the examination and put it back on when he was finished. I was taken back to the courtyard where I remained until around 8:00 a.m. I was then put back in the jeep where I sat on a seat. The jeep drove for about 30 minutes before stopping at the settlement of Etzion where I was immediately taken for interrogation. The interrogator did not introduce himself. He removed the blindfold but kept my ties on. The interrogator accused me of throwing stones at soldiers and of setting the bushes near the settlement on fire. I denied the accusations and told him I had nothing to do with such things. He did not inform me of any rights. The first round of interrogation lasted for about an hour. I was then blindfolded and taken back to the courtyard where I sat on the ground for about four hours. I was allowed to use the toilet and to drink water. I was then taken back to the interrogation room for a second round of interrogation. The second interrogator showed me a document saying I had the right to remain silent and the right to consult with a lawyer. He accused me of starting a fire near the settlement. I denied the accusation. He then took me to see an Israeli policeman who printed out my statement in Hebrew and asked me to sign it. I signed it although I didn’t understand what was written in it. A policeman took my photograph and my fingerprints. He also called my brother and told him I was going to be transferred to Ofer and that I would have a hearing in the military court on 20 August. I was then strip searched and taken into a cell where they removed the ties. I remained in the cell until around 8:00 p.m. when I was shackled and handcuffed and driven to Ofer prison. At Ofer I was taken out of the vehicle and strip searched again. I was then taken to Section 13. On the 20 August I was told I had a military court hearing but I was never taken to the court. I later found out that my father came to court but the authorities sent him back home. At around 4:00 p.m. soldiers told me I was going to be released. I was released at around 8:00 p.m. and I took a taxi home by myself. I was released without charge and without appearing in court.